I’ve had the chance to play Strike Vector EX during Paris Games Week while also asking a few questions to Pierre-Etienne Travers, Co-Founder and Co-Owner of Ragequit Corporation (an indie studio based in Paris). Strike Vector EX is the console version of Strike Vector, a multiplayer aerial FPS (as defined by the developers) first released on PC (Steam) in January 2014. The biggest news is the inclusion of a proper single player campaign, which is absent on PC; there will be ten missions with a full fledged storyline narrated through cutscenes, and even leaderboards to compete online on each mission’s score. Another major complaint of the previous version has been addressed: AI opponents will now fill multiplayer matches whenever there are not enough human opponents. 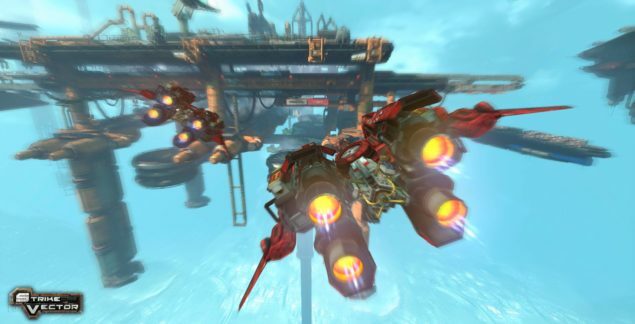 According to Travers, Strike Vector EX is also more accessible in terms of controls, something that proved to be an issue with the PC version of the game where only the dedicated players kept playing after a while. Ragequit also switched to Unreal Engine 4 for the occasion and they confirmed that the game will run at 1080P on PlayStation 4 and 900P on Xbox One, with both versions aiming for steady 30FPS. Another change when compared to Strike Vector is that your vehicle (customizable in both aesthetics and functionality) will now have only one weapon as opposed to two. This is because it was possible to dual wield the same weapon and the “pro” players tended to do this all the time, so eventually Ragequit decided to make this change for Strike Vector EX. Personally, I’m not a huge fan of dogfighting games, especially because I generally get motion sickness from them. However, that wasn’t a problem with Strike Vector EX. In this game, there are two different modes: Jet Mode allows you to move at high speed and evade projectiles, while Stationary Mode lets you vehicle hover in the air and fight with a lot more precision; combat happens mainly in this latter mode. Overall, my brief playtime with Strike Vector EX proved to be really fun. 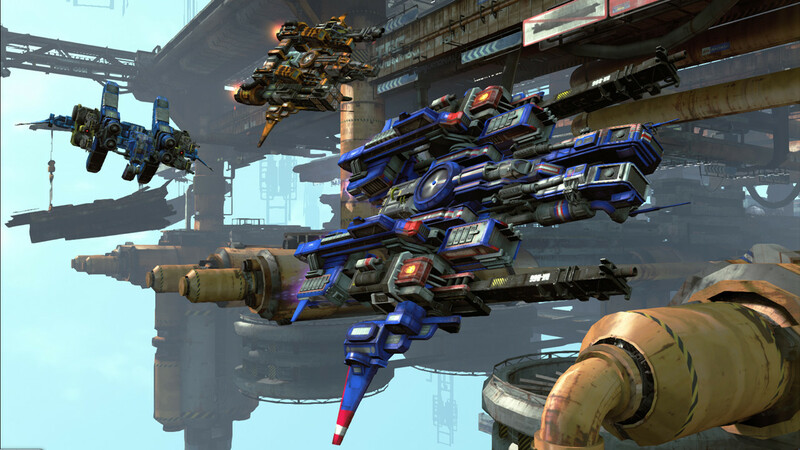 Soaring through the skies and avoiding obstacles while fighting multiple enemies at once was exciting to say the least; Ragequit might just have something unique here, because Strike Vector is very far removed from your average dogfighting game. Even so, Travers said that the team will probably move onto a new project next, as they have been working on this IP for quite a while. The game was actually supposed to come out during Summer, but the team is now targeting early 2016 for the release; in the same time frame they will announce plans for the PC version of Strike Vector EX, which isn’t official yet but if their hints are any indication, is definitely coming. In the meantime, here’s the latest trailer.